Dr. Goto gave an invited talk at SMEC2019 (Miami)! Welcome party for three undergraduate students and Dr. Yamashita. Mizuguchi & Goto attended the ECMP2019 in Higashi-hiroshima. Farewell party for Sudo & Yuwen. Mizuguchi & Hoshi attended the APS march meeting 2019 in Boston. A paper on the observation of two-fold symmetric magnetoresistance in LaO0.5F0.5BiSSe has been published in JPSJ. A paper on NdO0.8F0.2Sb1-xBixSe2 has been accepted in JPSJ. Hoshi has been awarded a Poster Presentation Award. Mizuguchi has been awarded "Condensed-Matter Science Prize". Mizuguchi participated in the E-MRS Fall meeting and gave a talk. Goto recieved the presentation award at the 15th Japan Thermoelectric Society conference. Sogabe & Hoshi gave oral presentations at the JPS meeting. Sogabe, Hoshi, Goto, and Mizuguchi participated in the M2S-2018 conference. Paper on the discovery of SC in NaSn2P2 by Y. Goto et al. has been accepted for publication in Sci. Rep. List of papers on SnPn-based compounds is now available. "Leading Researcher" title has been given to Prof. Mizuguchi (2018-2020). Sogabe's work on La1-xCexOBiSSe was accepted for publication in EPL. Goto's work on REOSbSe2 was accepted for publication in JPSJ. Dr. Rajveer Jha joined us! Sogabe's work on high-entropy-alloy-type BiS2 superconductor was published in APEX. Prof. Mizuguchi received a certificate for Highly Cited Researchers 2017 from Clarivate Analytisc. 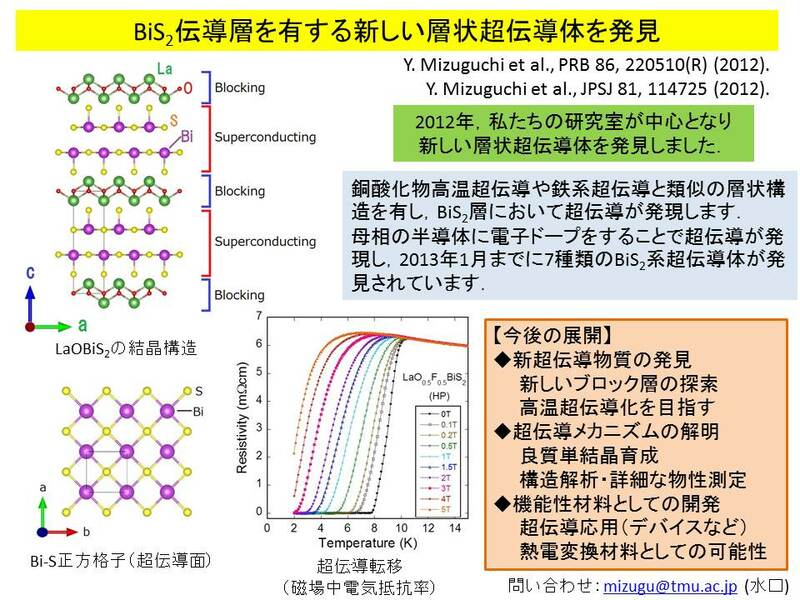 Hoshi's work on Se isotope effect in BiCh2 superconductor was published in PRB. Synchrotron powder XRD at SPring-8. A paper on thermoelectric AgBiSe2-xTex was published in Dalton Trans. Dr. Goto's paper was published in Joule. A paper on local structure of REO0.5F0.5BiS2 was published in JPSJ. Dr. Goto's comments on the discovery of NaSn2As2 superocnductor was released. Prof. Mizuguchi has been selected as Highly Cited Researchers 2017 by Clarivate Analytics. RIKEN international workshop on condensed matter physics. We discovered new layered superconductor NaSn2As2 (published in JPSJ). Dr. Goto gave an invited talk at the thermoelectric society workshop.